A selection of tutorial models and examples are presented in this section. These and other model examples can also be selected and automatically run from the File > Model Examples and Tutorials... menu. When an automated tutorial is selected, the Run Model dialog box will open and show a description and information about the tutorial example. The tutorial can be started by pressing the Run button. de-selecting the Tutorial mode toggle button will run the tutorial in fast automatic mode without any pauses. When a tutorial or finite element script (fes) model is run, the GUI Playback Control panel below is opened where the Playback Speed can be controlled via the slider. Setting the slider to the slowest (far left) setting pauses the tutorial playback and enables the Step button to manually step through the tutorial at ones own pace. Closing the playback control panel or pressing the Cancel button stops the tutorial at the current state. 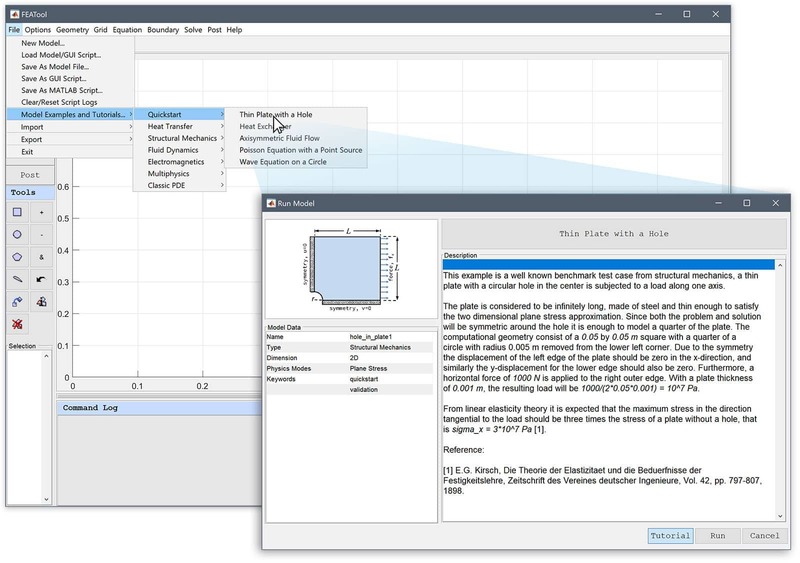 The following selection of MATLAB m-file script examples and test cases can be found in the examples directory of the FEATool installation folder. ex_axistressstrain1 Axisymmetric stress-strain of a hollow cylinder. ex_axistressstrain2 Axisymmetric stress-strain of a hollow sphere. ex_axistressstrain3 Axisymmetric disc with fixed edge and point load. ex_axistressstrain4 Stress formed in brake disk due to heat build up. ex_axistressstrain5 Axisymmetric vibration modes of a hollow cylinder. ex_brinkman1 Coupled porous and incompressible laminar flow. ex_classicpde1 Eigenmodes for a circular drum. ex_classicpde2 Eigenmodes for a L-shaped membrane. ex_compressibleeuler1 1D compressible Euler SOD shock tube problem. ex_compressibleeuler2 2D compressible Euler oblique shock problem. ex_compressibleeuler3 2D compressible Euler reflected shock problem. ex_compressibleeuler4 2D compressible Euler inviscid supersonic flow over a bump. ex_convdiff1 Convection and diffusion on a unit square. ex_convdiff2 Periodic convection and diffusion on a line with exact solution. ex_convdiff3 Infinite time dependent convection and diffusion on a line. ex_convdiff4 One dimensional Burgers equation with steady solution. ex_convdiff5 Dominating convection example requiring artificial stabilization. ex_convdiff6 1D stationary convection-diffusion-reaction with exact solution. ex_convreact1 Time dependent one dimensional convection and reaction model. ex_custom_equation1 Black-Scholes model equation implemented as a custom equation. ex_darcy1 Porous media flow in a packed bed reactor using Darcy's law. ex_diffusion1 Diffusion equation on a unit square with different solutions. ex_diffusion2 Diffusion equation on a line with exact solutions. ex_electrostatics2 Axisymmetric model of a spherical capacitor. ex_euler_beam1 1D Euler-Bernoulli beam example. ex_euler_beam2 1D Euler-Bernoulli beam vibration mode example. ex_euler_beam3 1D Euler-Bernoulli beam vibration example. ex_heat_exchanger1 Free and forced convection in a heat exchanger. ex_heattransfer1 2D heat conduction with natural convection and radiation. ex_heattransfer2 One dimensional stationary heat transfer with radiation. ex_heattransfer3 One dimensional transient heat conduction. ex_heattransfer4 Two dimensional heat transfer with convective cooling. ex_heattransfer5 Two dimensional transient cooling shrink fitting example. ex_heattransfer6 Axisymmetric steady state heat conduction of a cylinder. ex_heattransfer7 One dimensional transient heat conduction with analytic solution. ex_laplace1 Laplace equation on a unit square. ex_laplace2 Laplace equation on a unit circle. ex_linearelasticity1 Linear elasticity test case, solid stress-strain for a cube. ex_linearelasticity2 Three dimensional example of stress on a bracket. ex_linearelasticity3 Parametric study of the bracket deformation model. ex_linearelasticity4 Stress of loaded I-beam supported by two brackets. ex_linearelasticity5 Vibration of a square plate. ex_magnetostatics2 Magnet field around a horseshoe magnet. ex_magnetostatics3 Cylindrical magnet without electrical currents. ex_magnetostatics4 Axisymmetric model of cylindrical magnet. ex_magnetostatics5 2D Magnetostatics test model. ex_multiphase1 Multiphase flow example of a static bubble. ex_multiphase2 Multiphase flow example of a rising bubble. ex_multiphase3 Multiphase flow example of a breaking dam. ex_natural_convection Natural convection in a square cavity. ex_navierstokes1 Incompressible fluid flow in a channel. ex_navierstokes2 Incompressible driven cavity flow. ex_navierstokes3 Incompressible fluid flow around a cylinder in a channel (Re=20). ex_navierstokes3b Flow around a cylinder solver benchmark. ex_navierstokes4 Incompressible fluid flow over a backwards facing step. ex_navierstokes5 Two dimensional decay of a standing vortex. ex_navierstokes6 Time dependent flow around a cylinder in a channel (0<=Re<=100). ex_navierstokes7 Laminar flow in a curved three dimensional pipe. ex_navierstokes8 Axisymmetric flow in a circular pipe. ex_navierstokes8b Axisymmetric pipe flow solver benchmark. ex_navierstokes10 3D flow in a pipe using the OpenFOAM solver. ex_navierstokes11 3D cavity flow in a cube using the OpenFOAM solver. ex_navierstokes12 3D flow over a backwards facing step using the OpenFOAM solver. ex_navierstokes13 3D flow past a cylinder using the OpenFOAM solver. ex_navierstokes14 2D Pousille flow due to pressure gradient. ex_nonlinear_pde1 1D nonlinear PDE with analytical solution. ex_nonlinear_pde2 1D nonlinear PDE with analytical solution extended to 2D. ex_periodic1 Moving 1D pulse in a periodic domain. ex_periodic2 2D Periodic Poisson equation example. ex_piezoelectric1 Bending of a beam due to piezoelectric effects. ex_planestrain1 2D Plane strain analysis of a pressure vessel. ex_planestrain2 3D Plane strain analysis of a pressure vessel. ex_planestress1 Stress computation for a hole in a thin plate. ex_planestress2 NAFEMS plane stress benchmark example. ex_planestress3 NAFEMS plane stress benchmark of a tapered plate. ex_planestress4 NAFEMS benchmark of plate deformation due to thermal stress. ex_planestress5 NAFEMS benchmark for plane stress in an elliptic membrane. ex_planestress6 2D Plane stress analysis of a pressure vessel. ex_poisson1 Poisson equation on a line. ex_poisson2 Poisson equation on a circle. ex_poisson3 Poisson equation on a unit square. ex_poisson4 Poisson equation on a rectangle with complex solution. ex_poisson5 Poisson equation on a sphere. ex_poisson6 Poisson equation on a unit cube. ex_poisson7 Poisson equation on a unit circle with a point constraint. ex_potential_flow1 Potential flow around a NACA wing profile. ex_resistive_heating1 Resistive heating of a spiral tungsten filament. ex_robinbc1 1D example with a Robin boundary condition. ex_spanner Gmsh import of a mesh and stress calculation in a spanner. ex_swirl_flow1 2D axisymmetric swirl flow in a tube with analytic solution. ex_swirl_flow2 2D axisymmetric swirl flow in a stepped narrowing tubular region. ex_swirl_flow3 2D axisymmetric time dependent Taylor-Couette swirl flow. ex_swirl_flow4 2D axisymmetric swirl flow around a rotating disk. ex_waveequation1 Wave equation on a unit circle.